The Grief Hole Illustrated: An Artist’s Sketchbook Companion to Kaaron Warren’s Supernatural Thriller, by Keely Van Order will be released next month. Those who ordered it as part of the Limited Edition offer for The Grief Hole are locked in for shipment as soon as the book is printed, but we are offering an excellent preorder price for Australian readers only right now: $36.95 including shipping and GST. This offer will cease in early February 2017. Kaaron Warren’s novel, The Grief Hole, is fast becoming a dark literary classic, and it was enhanced by internal illustrations, and cover art/design by Canberra-based artist, Keely Van Order. This art portfolio traces Keely’s passage to the final illustrations and designs, including variations on themes, mood sketches, and pieces of art that were worthy of publishing, but just didn’t quite make it the limited number required for the final product. Keely provides notes on her journey and includes excerpts from The Grief Hole that enables the viewer insight into the direct sources of inspiration for the art. Keely Van Order’s art and design for The Grief Hole, compiled in this beautiful book, is an apt companion volume to the novel, and captures the spirit of Kaaron Warren’s masterpiece as a stand alone work. The Grief Hole Illustrated is 74 pages in length with premium colour printing and paper. It is hard cover with matte finish lamination. To showcase Keely’s work, the book is 280 x 216mm in size (11″ x 8.5″). CLICK HERE to preorder Keely’s magnificent work for AU$36.95 (Australia only, GST and Shipping included) It will retail in Australia for $39.95 (GST include, not shipping). And so begins Keely Van Order’s harrowing journey illustrating Kaaron Warren’s disturbing and dark fantasy The Grief Hole. This was no ordinary commission. But then this was no ordinary story. In this portfolio we follow Keely’s creative journey; her conceptual explorations with styles, with techniques, with fonts. Here we have sketches, detailed notes, cover variants, final art, and work rejected due to printing concerns. We get a sense of what she was feeling as she worked through the book. We share her determination to reveal the face of the charismatic, shaman-like Sol Evictus, to unmask him, to deny him being reduced to a mythological archetype. To make him real. And this is where the value of an illustration can override a reader’s imagination. Throughout publishing history we have great collaborations between writers and artists. Can you imagine A. A. Milne’s Winnie the Pooh without the fragile delicacy of E. H. Shepard, or Lewis Carroll’s Alice in Wonderland without the slightly psychotic John Tenniel, or John Marsden’s The Rabbits without the politically savvy Shaun Tan? And now we have Keely Van Order’s dark, brooding, melancholia. Kaaron Warren is a fortunate author indeed. I’m one of those people who watches all the extras on a blu-ray disc. Partly because I enjoy that insight into how visual effects are created, and what they decided to leave on the (now digital) cutting room floor; and partly because I always harbored ambitions to work in the film industry myself. Despite knowing the magician’s tricks, I can still draw a distinction between the behind-the-scenes details, suspend my disbelief, and enjoy the movie—not as some technical exercise—but as a piece of pure story-telling. Although I did work peripherally in the film industry, most of my career was directed towards graphic design and illustration. Which means this portfolio is like one of those blu-ray extras for illustrators. Very few people realize or appreciate how much effort an artist puts into creating work for a book. What makes this a particularly unusual and challenging project is that this story involves an artist sent to capture the faces of dying teenagers—who in doing so dies in a ‘grief hole’. And in taking this project on, Keely has in many ways become that artist, taken on that persona. This is not a happy head-space. When illustrating a manuscript, an artist doesn’t casually read it. They diligently scour every word to find those key pivotal moments that have the highest emotional and visual impact. As you turn every page of this portfolio, you can see Keely immersing herself in Kaaron’s bleak world, where each word takes on a deeper meaning, evoking a mood, stimulating the possibility of a visual interpretation. This level of engagement makes for great art. On a purely artistic level, despite Keely’s distinctive, idiosyncratic style, do I detect echoes of an Eastern European aesthetic—perhaps Czech? I’m now thinking of those bizarre Polish and Czech movie posters that have nothing whatsoever to do with the films they are meant to be spruiking, yet remain intriguing works of art on their own terms. Do I sense the influence of cover artists I grew up with – Richard Powers, or Bruce Pennington—hovering around Keely like the ghosts Theresa sees? Perhaps. Or perhaps that’s just me making connections with the artists who served as my inspirations. But then again, like the grief holes themselves, these things are “never seen the same by any two people”. So look carefully. I’m trusting that after dutifully examining each sketch, each note-to-self, each final illustration, you might glean just what an extraordinary collective work of art Keely Van Order has created. In this case, knowing the magician’s tricks enhances Kaaron’s world. And a personal thank you to Gerry Huntman for having the foresight and wisdom to connect Keely with Kaaron—a true symbiotic relationship—and for publishing this portfolio. It’s not often we are granted the opportunity to take a peek into an artist’s process, especially in such a handsome format. 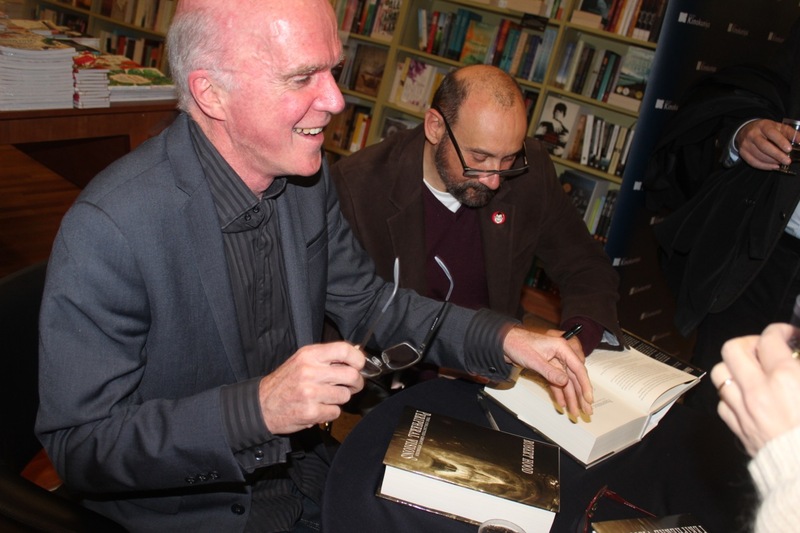 Sydney’s official launch of Robert Hood’s definitive ghost collection, Peripheral Visions, was held on Thursday evening 16 July 2015 with a great turnout at Kinokuniya Bookshop on George Street. It was slickly supported by the excellent staff and owner of the bookshop, nibbles and drinks abounded, and Garth Nix did a fantastic job introducing Robert and Nick Stathopoulos, the great illustrator of the cloth bound edition. The bookstore staff set up a screen and an upgraded version of the Peripheral Visions book trailer ran on a continuous loop in the background, and that impressed all who attended. They even had two door prizes which comprised of (to quote Robert), “Minion carry-bags, each with a copy of Daikaiju! 3, a packet of jelly dinosaurs, and a skull shotglass… yes, you heard right…” All in all it was a great success, including the signing of a heap of books and a convivial atmosphere. 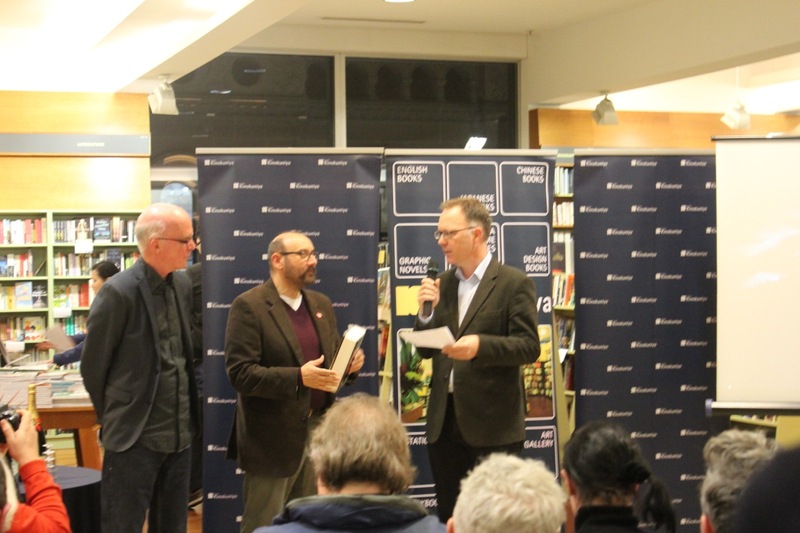 It was a terrific night in every way, and one the publisher, IFWG Australia, its Managing Director and Chief Editor Gerry Huntman and Marketing Officer Stephen McCracken should be very happy about, seeing the book they put a lot of faith and effort into being greeted with such good-will, enthusiasm and classiness. The staff of Kinokuniya were accommodating and endlessly helpful, the set-up was fab, and the audience a wonderful mob of well-wishers — great people. 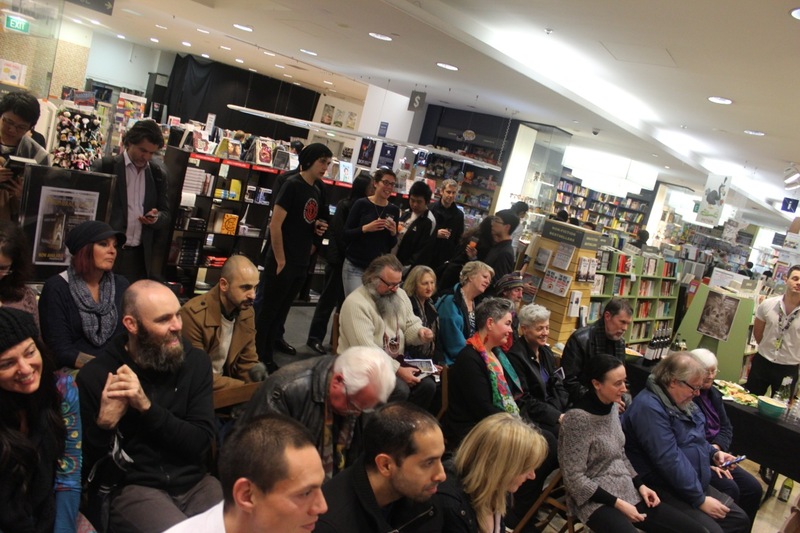 I thank you all for braving the weather and Sydney traffic to get there — and then for so many of you buying the book. I hope you enjoyed the night and will, given time to read those 823 pages, enjoy the book! Finally, thanks again to IFWG Australia Publishing for all their effort and support, and for producing such an excellent book — one I am very proud of. And thank you, Robert, for accepting our offer to publishing your amazing and comprehensive collection of work, and Nick Stathopoulos for accepting the commission for his outstanding cover and internal artwork. 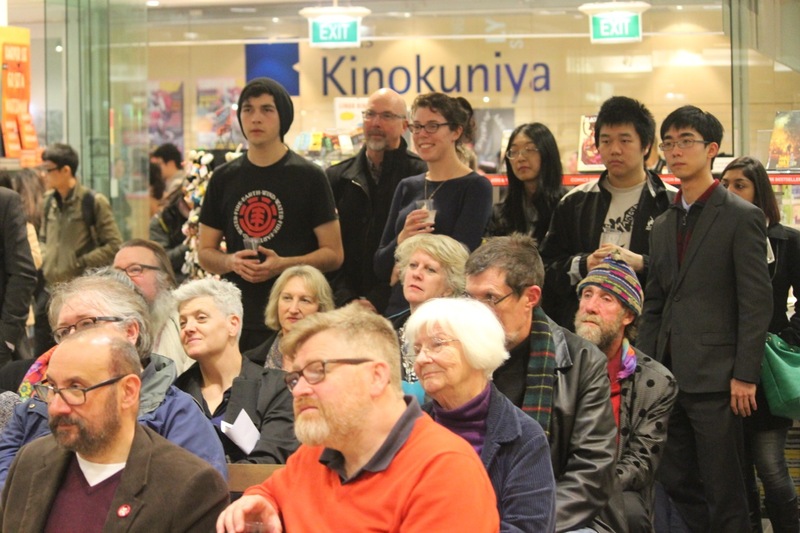 We echo Robert’s nod to Garth Nix, Cat Sparks and the staff and owner of Kinokuniya in Sydney, who helped make the official launch a great success. Kinokuniya can be contacted via their website, www.kinokuniya.com.au. Below are a sample of photographs taken at the event (permission granted from Catriona Sparks). 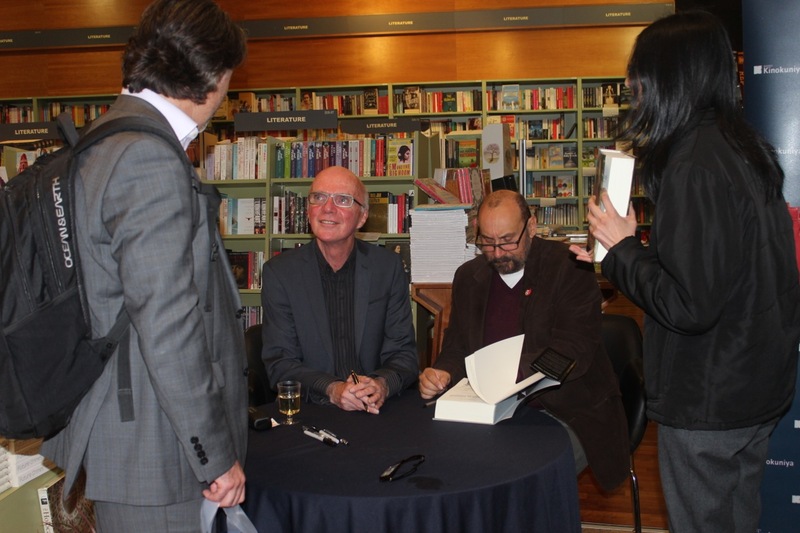 Multi-award winning writer Robert Hood will sign his definitive collection at leading Sydney bookstore, Kinokuniya. PERIPHERAL VISIONS is a unique reference collection that includes all of Robert Hood’s 44 ghost stories to date, three of them especially written for this volume. 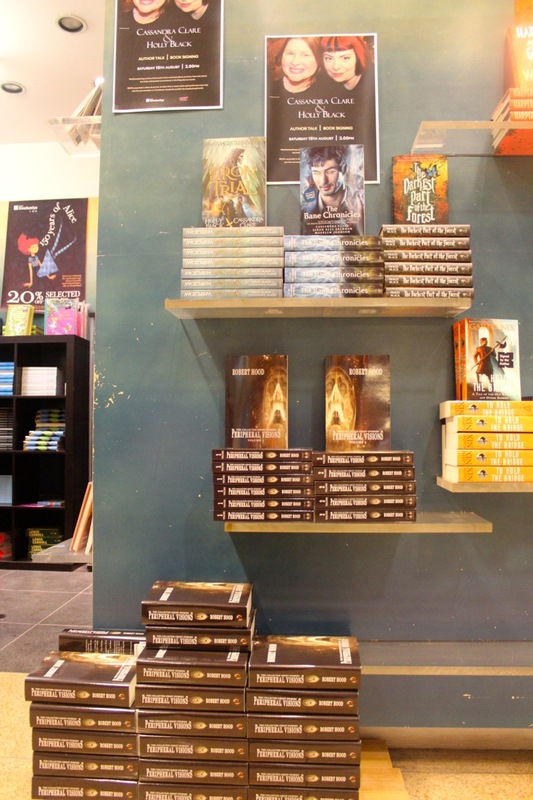 Kinokuniya (Level 2, The Galeries, 500 George Street, Sydney NSW 2000) will host the signing on the 16th of July at 6:30pm. Garth Nix, one of Australia’s greatest fantasy authors, will introduce Robert and special guest Nick Stathopolous, who will both talk about their work related to the book. Both Robert and Nick will be available for signings afterwards with copies of both the premium hard cover edition and the trade paperback in store for purchase. Robert Hood has been called everything from “a brilliant fantasist” (Jack Dann) to “Aussie horror’s wicked godfather” (Black Magazine). He is a highly respected, award winning author, considered by many to be one of Australia’s grand masters of horror and weird fiction. In a career that spans 40 years, he has published speculative fiction of all kinds—including most notably this collection of 44 short stories that feature ghosts, hauntings, and spectral horrors. Further information on his work can be found at: www.roberthood.net and www.roberthoodwriter.com. The cover is a wonderful piece of art by Multi Archibald Prize and 2015 BP Portrait Prize finalist, Nick Stathopoulos, and the hard cover edition has more of Nick’s original work for each section of the book. Robert and Nick can be contacted through the publisher, IFWG Publishing Australia (ifwg@ifwgpublishing.com).